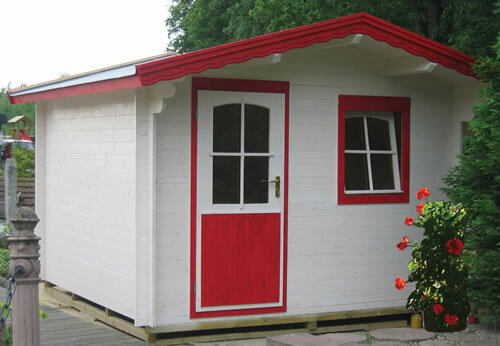 Stockholm log cabin in 28mm wall log thickness. 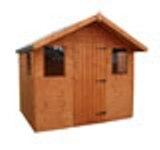 Measuring 3m wide x 2.5m deep (9'8 x 8'2) ideal for use as a small office or garden shed. 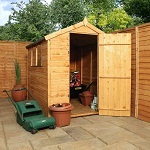 ASn attractive storage solution for your garden with a 70cm frontal porch overhang. It comes untreated but can be bought to life if painted. 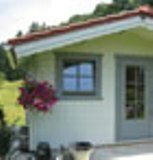 A traditional cabin shed 2.44x2.44m available with an additional verandah. 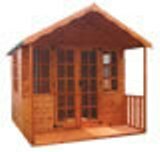 Balmoral Summerhouse 4.27x3.66m, a spacious garden building with various options. Wooden Composter for creating your own organic compost. Featuring slatted sides for improved ventilation. The Austin Shiplap Apex Shed measuring 7x5 complete with solid sheet floor / roof and styrene windows.